This specialist course has been designed to prepare you for the growing demands of the healthcare sector and pharmaceutical industry. As well as essential chemistry topics, you'll study topics such as pharmacokinetics, toxicology and drug design. You'll learn to use industry standard commercial software and spend most of your final year working on your own biological and medicinal chemistry research project. All of our undergraduates take the same modules in their first two years. You'll have the freedom to specialise later in your degree. Our courses are accredited by the Royal Society of Chemistry, so you will cover all of the organic, inorganic, physical and analytical chemistry that a professional chemist needs to know. 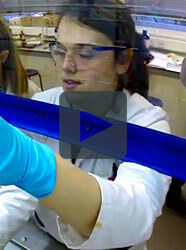 In first year, you'll spend a day a week in the lab, learning essential skills and techniques. You will study topics including the structure of atoms and molecules, how chemical reactions happen, and how to identify and analyse different chemicals and elements. You'll also look at the biological processes that chemistry drives, and the technologies and products that chemistry has made possible - from cosmetics to explosives. In second year, you'll start spending two days a week in the lab, as you learn to run more complex experiments. You'll move on to study more advanced topics in organic chemistry (functional groups, synthesis, biopolymers), inorganic chemistry (main group compounds, transition metal coordination complexes, inorganic solids) and physical chemistry (quantum mechanics, thermodynamics, polymers and colloids). In third year, you'll work on your own research project: you'll gather and evaluate data, run your own experiments and present your findings. You'll have a wide range of optional modules to choose from too, with topics ranging from energy storage to chemistry in space. In fourth year, you'll join one of our research groups spend most of your time working on a major research project. You'll choose the topic, get specialist training from professional scientists and have access to state-of-the art equipment. Again, you'll also have lots of optional modules to choose from, so you can tailor your degree to suit your interests and career goals. All of your lectures are backed up by small group tutorials, where you can delve deeper into complex topics. These small group teaching sessions are led by your personal tutor in first year, and specialist tutors who are experts in the specific topics you're studying in later years. Your personal tutor will also help you work out which skills you need to develop and support you as you build up your CV in time for graduation. The Department of Chemistry was one of the University's first departments when it was founded in 1905. Since then, four Nobel Prize winners have either worked or studied in the department, and today researchers are working on big scientific challenges, ranging from antimicrobial resistance and environmental sustainability, to cancer treatments and new technological solutions for industry. Our main home, the Dainton Building, and the Richard Roberts Building next door, have plenty of teaching spaces, as well as the labs where you'll train from the start of your degree and the world-class research facilities you can access later. We have three large teaching labs where you'll spend a lot of time during your degree: one for organic chemistry, one for inorganic chemistry and one for physical chemistry. Each lab is equipped with specialist analytical equipment, including nuclear magnetic resonance, infrared and ultraviolet spectrometry, and gas- and size-exclusion chromatography. Our advanced lab is used for the group research project you'll complete in your third year, with large fume cupboards and workbenches to make collaborations easy. We are also home to a number of multimillion pound research laboratories. These include the Lord Porter Laser Laboratory, which has three different laser stations that can be used in studies ranging from energy transport in molecules and materials, to artificial photosynthesis, and our Soft Matter Analytical Laboratory, where scientists can study samples that are 100 times smaller than a human hair. 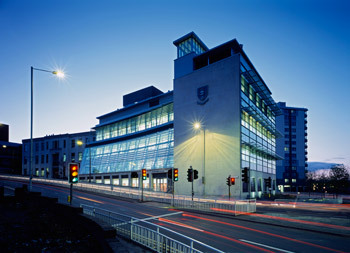 We're just across the road from the award-winning library facilities at the Information Commons and the Diamond, and the UK's number one students' union, all within a short walk of the city centre. Our courses have been created with your career in mind. All of our modules have been designed to give you skills for your CV - problem solving, team working, fact finding, data analysis, critical thinking, communication, project management - and experience you can talk about at job interviews. As part of your course, you'll develop your own idea for a chemistry business and pitch it as part of a group. On our Skills For Success training programme you can get experience of public speaking, presenting a poster, hosting a debate or producing a video. At our annual careers day you can explore career options, meet with employers who hire chemistry graduates and get tips from former students to help you take your next steps after graduation. Some of the biggest employers of our students are pharmaceutical companies (such as GSK and RB), where chemists develop new medicines, and consumer goods companies (such as Unilever), where they make lots of the products you see on supermarket shelves. Graduates can also go behind the scenes, creating the chemicals and materials that make industrial manufacturing possible. The science industry is more than just scientists though - big companies like Unilever and GSK need graduates who understand science to work in communications, market research and business development roles. If the lab is where you feel most at home, you could also work as a scientist at a university or research institute. To follow this path, many of our students build on their undergraduate research by staying with us for their PhD. Graduates can also stay connected to academia by working for scientific journals, publishing the latest research. What if I want to work outside science? A good degree from a top university can take you far, whatever you want to do. We have graduates using their scientific minds in everything from finance to computer programming. Get a feel for what it's like to study chemistry at Sheffield. Our staff are enthusiastic about teaching and will provide the support you need to thrive. We have specialist teaching labs, which include a dedicated NMR spectrometer for undergraduates. "All of the staff involved in the running of the Biological with Medicinal Chemistry degree were very supportive throughout the four years, and were always helpful if we had any questions or problems. One of my favourite parts of the course was learning about the process involved in the the development of a new drug." Each year undergraduate students can apply to join the Sheffield Undergraduate Research Experience scheme. This gives you the chance spend around six weeks working in one of our research groups over the summer. It's designed to give you even more research experience to put on your CV, and can help you stand out when you're applying for jobs. We can guarantee you a summer research placement if you meet the requirements of our Undergraduate Research Scholarship scheme. You need AAA or above at A Level (or equivalent) and to maintain an average grade of 60 per cent or higher during your course.